“The full moon rises tonight, my son,” said the noblewoman to her boy, a child of only three winters. She pulled her furs around her shoulders, the frigid twilight air chilled her to the bone, despite the accursed boiling of her blood. Even a full day away, the waxing moon goaded her to succumb and submit to the power of the wolf. She knelt down and looked her son in the face, and gripped his hand tightly. “Remember what I’ve taught you. Every day, you resist this curse. And every day I’m proud of you. But tonight, you will not be able to resist. When the moon rises in the sky…” She twitched, and her nails, even now beginning to grow into long, pearly claws, dug into her son’s palm. The boy yelped and recoiled. His blood trickled down his arm until the wispy, gray-black fur growing upon his skin halted its flow. He put the edge of his palm into his mouth to stem the bleeding. His mother stepped forward to pull his hand from his mouth, but stopped when a shadow fell over him. A figure stood atop the battlements, eclipsing the setting sun and casting the boy in darkness. The figure dressed in the clothes of a man, but his limbs were long and hairy. His knees bent the wrong way, and his nails were long and dagger-sharp. His nose extended into a muzzle covered with blood-matted fur. “I said, get away!” roared the noblewoman. She lunged at the man, and the silver dagger dropped from her hand as her entire body stretched and distended, growing hairy and silver. Before the man could react, a monstrous wolf wearing the tattered remains of a nightgown was upon him, snarling and tearing into his flesh with razor-sharp claws. As the werewolves fought, their son fled. Their battle raged until the moon rose high into the night sky, and the dark forest echoed with a chorus of bestial howls. Werewolves are among the most iconic monsters of European folklore and Western fantasy. Even in times when fantasy fiction has fallen out of vogue, the myth of the wolf-man survived in horror films and other paranormal tales. Stories of shapeshifters who take on the form of animals, both good and evil, are widespread throughout all folkloric traditions. Much like witches, vampires, and other classic horror-fantasy creatures, the D&D version of the werewolf is a distillation of innumerable conflicting mythologies. Indeed, despite its lupine etymology, the term lycanthrope has been broadened to include all manner of were-creatures, including werebears, wereboars, wererats, and even weretigers! 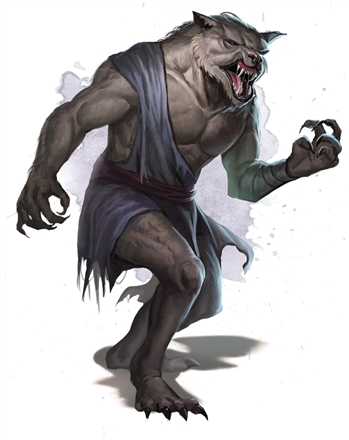 Lycanthropes in D&D also have one major difference from almost all folkloric representations of were-beasts: they can transform at any time, not just on the dreaded full moon! This makes it easier to use lycanthropes as a traditional enemy, but requires a bit of specialized knowledge beyond the broad understanding of folklore most D&D players might have. Let’s dive into a werewolf, their mythology in the worlds of Dungeons & Dragons, and some tactics for you to run them as intelligent and cunning foes for your party. Whether you’re watching The Wolf Man (1941), reading Harry Potter, or researching the medieval werewolf trials, you’ll find that the exact powers and behaviors of the werewolf differ dramatically based on the tale’s teller. In D&D, a werewolf is a humanoid that gained the power to transform into a wolf (or a wolf-human hybrid) after being bitten by another werewolf. In D&D, a werewolf can also be born with the curse if one or both of their parents are also werewolves, though apparently not all natural-born children of werewolves are fated to bear the curse of lycanthropy. Magic can be used to cure lycanthropy, though some lycanthropes would rankle at the use of the word cure. Werebear lycanthropes are compelled to acts of good rather than evil, and they tend to only use their bite to spread the power of their transformation to people who have earned such an honor. Similarly, evil people who have gained the power of werewolf lycanthropy revel in their newfound power, and are loathe to relinquish their gift. In real-world medieval Europe, werewolves were strongly associated with witchcraft and the heretical evil that they represented. However, some folklores included shapeshifters that transformed into animal shapes to fight against evil and Satanic forces. In D&D, not all lycanthropes are evil. Werewolves, wereboars, and wererats are innately drawn to the powers of chaotic evil, neutral evil, and lawful evil (respectively) by their curse. Werebears are drawn towards the neutral good alignment, and weretigers are compelled to acts of selfishness and isolation that causes them to tend towards true neutrality. Also, Curse of Strahd includes wereravens as a suspicious but lawful good lycanthrope. The most notable difference between D&D’s lycanthropes and the commonly known pop-mythology of the werewolf is that D&D lycanthropes can transform even when it’s not the full moon. Well, some of them can. In D&D, lycanthropes have a choice. If a being is cursed with lycanthropy, they can choose to resist it. The curse lingers within them, boiling and seething until the rising of the full moon grants it enough power to overcome the host’s resistance and take control. The Monster Manual says that “if the cursed creature is unaware of its condition, it might not remember the events of its transformation,” suggesting that some creatures might resist lycanthropy on instinct alone. Consider this house rule: unless a creature’s alignment is the same as the lycanthrope that passed on its curse, it automatically resists the curse unless it chooses not to. Lycanthropes who resist transform only on the full moon, like most pop culture werewolves. They go on a bloody rampage, during which time the DM might even take control of their character. Note that this rampage matches the alignment of the type of lycanthropy they are afflicted by, so while a werewolf may transform into a chaotic evil monster at the full moon, a werebear transforms into a frothing neutral good creature. What does that look like? Perhaps the bear stalks the forests, protecting travelers from marauding monsters. If you’re playing a more lighthearted game, perhaps they rampage into the local governor’s mansion and tear up all the tax records for people who can’t afford to pay. Lycanthropes who give into the curse, however, automatically change alignments to match their curse. Giving into the curse of werewolf lycanthropy, for example, instantly makes a creature prone to acts of chaos and evil. The Monster Manual suggests that the DM can automatically take control of a creature that gives in to the curse. In some games, this makes sense. If you have a group of players that can handle one person playing a chaotic evil character without ruining everyone else’s fun, there’s no reason for the DM to take your character away. Likewise, neutral weretigers and neutral good werebears (and frankly, lawful evil wererats) are probably all still good fits for the typical adventuring party. The main benefit of giving into the power of the curse is the ability to transform at will, allowing them to transform between human, beast, and a human-beast hybrid form as an action. As monsters, werewolves and other lycanthropes are fairly straightforward combatants. Their defenses are numerically weak across the board, with low AC and hit points, but a powerful werewolf might commission custom armor to wear in their hybrid form. However, all lycanthropes possess a potent immunity to damage from nonmagical weapons that aren’t silvered. Magical weapons, silvered weapons, and damage from other sources like spells still affect them normally, making this immunity less useful when facing high-level adventurers. At low levels, however, this damage immunity makes werewolves incredibly difficult to defeat without extensive (and perhaps expensive) preparation. Werewolves also possess a secret weakness—and a secret strength. They possess the “shapechanger” subtype, which has a few notable interactions. First, shapechangers like lycanthropes, mimics, and certain slaad are immune to the polymorph spell. This hidden resistance does little to help a werewolf, unfortunately, as a challenge rating 3 monster is probably not going to be the target of a character’s polymorph spell. It becomes much more potent in the hands of a lycanthrope player character or a lycanthrope NPC that has grown more powerful than the standard CR 3 werewolf. Secondly, the moonbeam spell—which can be cast by druids and paladins who follow the Oath of the Ancients—is especially powerful against shapechangers. Not only do shapechangers have disadvantage on saving throws to resist the spell’s damage, failing that saving throw also forces shapechangers to revert to their original form and can’t shift again until they leave the spell’s area. 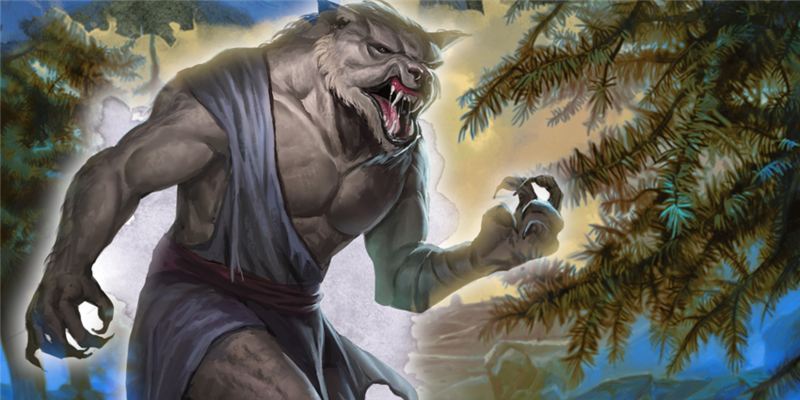 Since a werewolf’s humanoid form is weaker both offensively and defensively than its beast or hybrid forms, this spell can really spoil a werewolf’s day. Werewolves and other lycanthropes don’t possess any innate special abilities other than their ability to shapeshift, and their Keen Hearing and Smell trait. While some lycanthropes, like werebears, gain an additional movement option (a climbing speed), werewolves are locked to moving along the ground. Werewolves are proficient in the Perception and Stealth skills, making them skilled ambushers who can detect and hide from their prey with ease. Their Keen Hearing and Smell trait makes it even easier for them to follow their quarries. A werewolf always wants to engage its foes in its wolf or hybrid forms, unless it’s trying to conceal their lycanthropy. Since a werewolf’s immunities and hit points are the same no matter what form it takes, a werewolf might take the guise of an invincible champion of a human kingdom. Blades break against his “divinely blessed” skin, and he uses his power and reputation to get close to the nation’s monarch and transfer the curse of lycanthropy to them as well. Since D&D werewolves can choose to assume any form they like, you can use this to create a compelling mystery in your D&D game. Even though a werewolf’s abilities are fairly vanilla, their unique damage immunities, skill proficiencies, and rapid 40-foot movement pace allows you to play them differently from other enemies, even from other chaotic evil creatures like orcs. A battle with a werewolf has two main phases. The first phase is stalking—the werewolf stalks its prey before striking from surprise. If the werewolf is hunting with a pack of wolves, dire wolves, winter wolves, worgs, or other werewolves, catching a group of adventurers unawares might lead to a devastating surprise round. While other creatures might strike and then assume a defensive position, most werewolves are fully assured in their invincibility, and stand their ground even when outnumbered. Only when it’s revealed that a character possesses a magical weapon or a silvered weapon and can wound it would a werewolf start using more evasive tactics. Since werewolves are mechanically straightforward, you may want to make them more complex to keep your players guessing. Fortunately, since nearly any humanoid can be afflicted by lycanthropy, it’s easy to simply add traits from other stat blocks to the werewolf stat block. You might make a typical werewolf a more complex foe by giving it the spellcasting feature of a mage or a druid, allowing it to cast spells in humanoid or hybrid form, but not in wolf form. A werewolf spy or a goblin werewolf might use its Cunning Action or Nimble Escape feature to Disengage after every attack as a bonus action, forcing its foes to fight on its terms. What NPCs or humanoid creatures would make for interesting lycanthropes? A githyanki wererat? A bugbear werebear? Let me know in the comments what cool lycanthropes you might throw at your party! Why not make lycanthropes a playable race already? The Monster Manual covers PCs as lycanthropes. Mechanically and narratively, lycanthropes are not a fit for most games of D&D as a default. Keeping the option of lycanthropy in the DM's hands is more appropriate for D&D, though nothing is stopping a PC from wanting lycanthropy, perhaps even making it a goal of their character to become worthy of the Werebear or Wereraven forms. Because they aren't a race unto themselves. Lycanthropy is a curse (or blessing) that affects a person who already has a race of their own. It's already playable as a curse, and the abilities of that curse are already super strong. Making it into a race would either require significant nerfing (to make it hardly a were-creature at all) or creating a ridiculously excellent race that pretty much everyone would want to be. Also, because it's a curse, it's layered onto the race of the creature. So it's not really a race. They are, sort of. I am running the blood hunter class by Matt Mercer and there is a lycanthropy option at level 3. I am a were-yeth hound (for flavor) who gained his curse through his unknown parentage. That's part of why Shifters exist. Plus, immunity to nonmagical attacks is too strong for low-level PCs. One of the problems I have run into with monsters that come from traditional horror and making them scary for low level parties is damaging cantrips overcome their immunities. Vampire Spawn regeneration is overcome by any cantrip that does radiant damage. Lycantropes' damage immunity is circumvented by any damaging cantrip. The result in 5e has been, for me, monsters that should be a lot more frightening aren't. I haven't figured out a house rule to this yet. I used a werewolf mage before. Pretty effective. Also, I would say the CR is deceptive. If you don't plan for the werewolf to try and bite a player, I'd say they are CR 2 instead. If the immunity doesn't come into play, only CR 1. I use a variable CR system when I DM. No one, hits like Gaston, no one Crits like Gaston, no one's on page two hundred and six like Gaston. The characters find a woman, beaten and caged. Believing she's a prisoner, they release her and she joins the party. She quickly is quickly revealed to be a spell caster, a sorcerer. In the final, she is revealed to a weretiger. The PCs problem is that the weretiger goes on a rampage against her former captors, one of which the PCs need the capture alive and the weretiger does care about that little detail. I mean Shifter's are pretty close, and Pathfinder has an adaption called Skinwalker that can actually take on a slightly lycanthropic form. And there is always Order of the Lycan Blood Hunters. During the first couple of battles following, if he raged or took a certain amount of injury, there was a chance he would lose control and shift to the wolf form, and attack the nearest living creature...which usually turned out to be the party. Over the next 3 days of game time, the DC became easier. The character is trying to decide if he accepts the curse or not...so far he has declined to have it removed...so as he moves to acceptance...well...this was a great article! James? Is there a way to add lycanthropy to a character sheet on D&D Beyond? 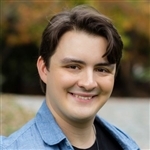 I'm dming a game, and one of my players asked how to add it to his character sheet, since we already agreed that it would be fine for him to have it. So I was wondering how you can mark it on your sheet. A question about their invincibility, only damaged by magic or silver weapons. Is one werewolf able to damage another. 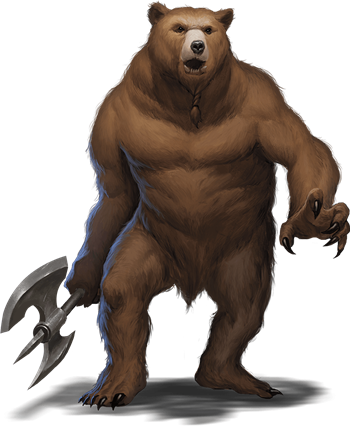 For a different take, if a party member is a werebear, would their unarmed attacks be able to damage a werewolf. werewolves have always been my favorite mythical creature. Thanks for this! can one change a lycanthropes alignment? 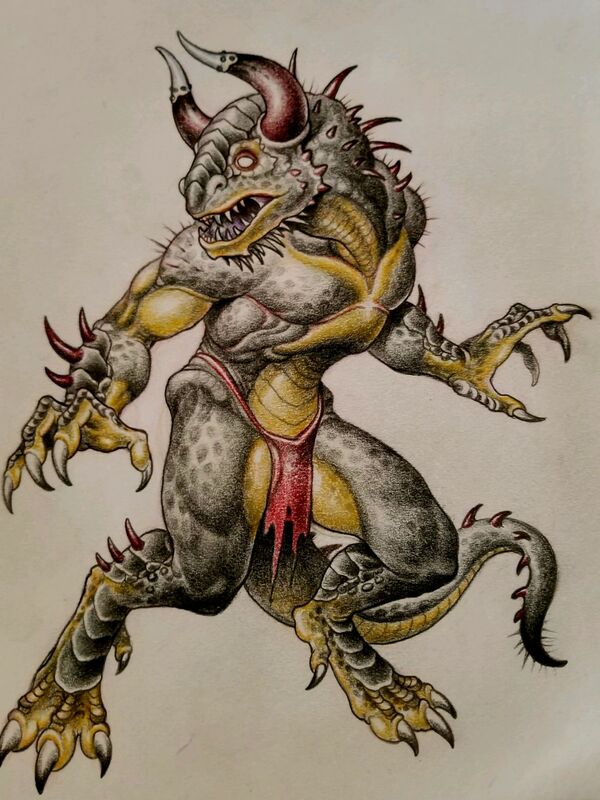 A character in my campaign plays a minotaur were-lizard.